The next in my continuing series of how to make your own natural homemade beauty products (see DIY Deodorant , DIY Eyeliner, or DIY Bronzer), is how to make your own blush. Now blush is definitely one of those things to pay attention to the ingredients of, as many of them have nasty ingredients in them. And even the more natural ones often contain corn, which many people don't tolerate very well. For those of you wondering why you would bother worrying about what goes on your skin, think of things like the nicotine patch. You put that ON your skin, yet the ingredients absorb into your skin, right? Our skin is one of our biggest organs and it absorbs things quite easily. It also keeps things out as well, but a large number of the toxins that find their way into our bodies either get ingested or absorbed. Or if you are trying to be really good not eating certain ingredients yet you put them on your skin – how many times a day do you put your hands near your mouth? So to prevent the yucky ingredient in mouth syndrome, I made a toxin-free, corn-free, garbage-free blush that I would feel completely safe putting on my skin. I have had a lot of success with the different color combos I have come up with. The color goes on beautifully and lasts all day long and the ingredients are so clean that I wouldn’t blink to eat them. Try that with one of those blushes you can find at the cosmetic counter in a department store! Yuck! This type of blush works best if you dip the brush into the mixture, then sort of blot/blend into the lid of the container or the back of your hand, then apply. If you have ever used any mineral blushes, like from Bare Minerals, etc, this is the same principle. As you can see in this picture below, you can dramatically vary the color based on the ingredients and proportions of the ingredients you use. 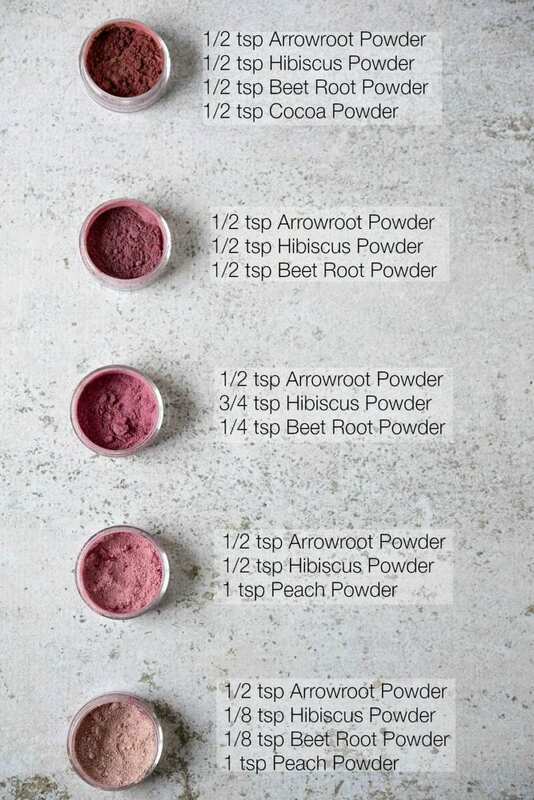 Always start out with arrowroot powder as a base (it applies to your skin very nicely and smoothly and holds the other colors well) and then add the color components. I like to experiment to see which combination I like best, but typically I have a few combos on hand to suit my mood or outfit or even how tan I am. It’s kind of addicting to see how many different colors you can come up with, and even use different ingredients to see if it makes a difference. You can make your own beetroot powder by dehydrating beets and then grinding them in a food processor, but I find it just easier to buy them. I get mine from Amazon. I also found the Hibiscus Powder on Amazon. The cocoa powder and arrowroot powder I get at my local grocery store. 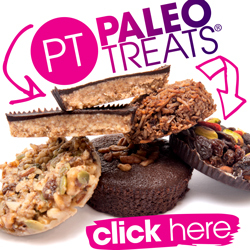 The peach powder is from freeze-dried Peaches that I use for a number of things (toppings on cookies, snacks, trail mixes, etc) and I get mine on Amazon too. I just powder it in a small spice/coffee grinder. The containers I use are from Amazon, but you can also just use a small glass jar. Watch this short, no-speaking video tutorial to see how easy this is to throw together. Go enhance your natural beauty and feel good about it too! 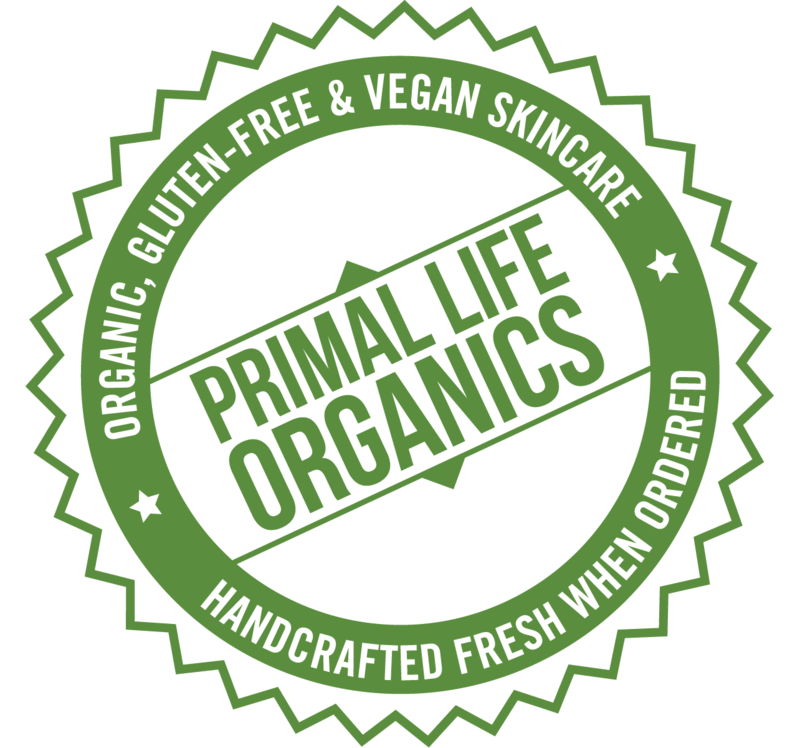 I often get questions about what moisturizer I use on my face, and I love the C-Ex Serum from Primal Life Organics. It's a bit pricey but I used to use some chemical-laden wrinkle-prevention thing from a beauty counter that cost even more, yet this works a lot better and I feel SO much better about putting it on my skin. LIKE MAKING YOUR OWN PRODUCTS? I LOVE this idea! You are always so clever!!!! Thanks Trisha 🙂 LOVING your new ebook right now. My photos are going to go to a whole new level! I have never heard of it causing facial hair! I’ve been using it for over a year and haven’t had any issues. Think you are pretty safe. Definitely Linda! Let me know if you make it! What is something natural I could add for some sparkle? How long will this last? Do you need to add a preservative? Hey Trisha- If you want some sparkle I’d recommend putting a bit of mica in it. Now, be warned that there is some research out there that says mica can harm your lungs, but it is also for very large amounts (like for miners of the mica). That being said, I’d be careful not to breathe in when applying the blush if that concerns you. Just take a deep breath or something 🙂 (I know, not the most pleasant thing on earth, what we do for beauty). And this will last about 3-4 months before I would probably throw it out and start a new batch. 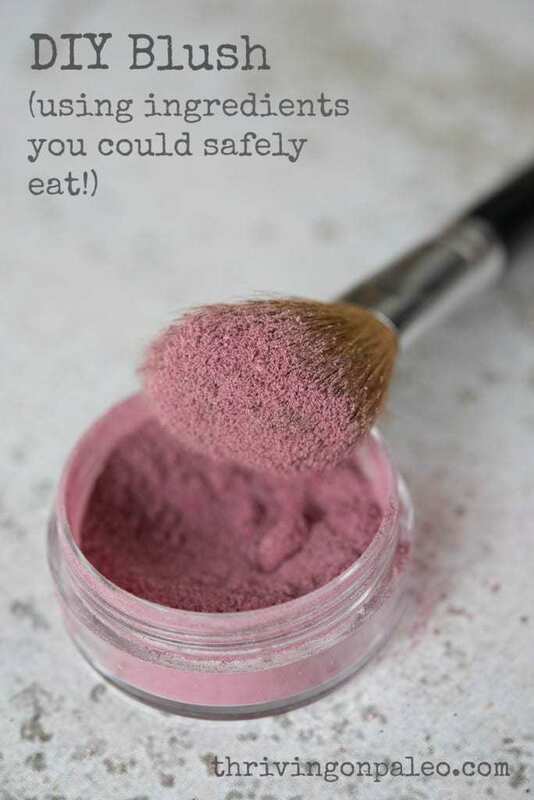 It technically is food so every time you put a brush to your face and then back into the blush you introduce bacteria. But other than the 3-4 month limit I wouldn’t say you’d need a preservative to make it last. It’s simple enough to concoct that I’d just go ahead and make a new one at that time. This is the best idea I’ve seen in a while. Can’t wait to try it! I tried it today, they looked amazing, but when trying to put it on it basically just brushed off. I even tried putting foundation on so it had something to stick to but still didn’t work. Any ideas? Hmm, interesting. I use it everyday and haven’t had any issues with that so let’s see if we can troubleshoot it. I’ll send you an email and we will work through it! I have had the same issue… any recomendations? I think we figured out that if you use a moisturizer or sunscreen right before applying it tends to stay better. I always use an oil-based serum (the C-ex I mention above) each morning and then apply this blush and that could be one reason why I have no issues with it staying. If your skin is completely dry (or if you tend to have dry skin) it might not adhere as well. Also, making sure you have enough arrowroot powder since that is really what helps it stick. 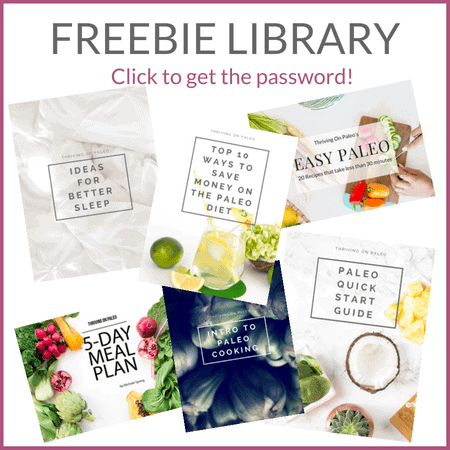 I hope these can help you! Do you have a foundation or concealer recipe? No, sorry, unfortunately I don’t at the moment. This is really amazing and ingenuitive. I will definitely try it out! I am so sorry to hear that you suffer from Hashimoto’s Thyroiditis AND Celiac Disease, but obviously you are making the best of everything and seeking to help others. I don’t know you, but I already have an enormous respect for you. Best wishes! Thanks so much Kat. I appreciate your kind words! I’d love to make this a cream blush. Any ideas? I honestly don’t know this one as every time I’ve tried using a cream blush I’ve looked like a clown (and a scary one, not the funny kind). 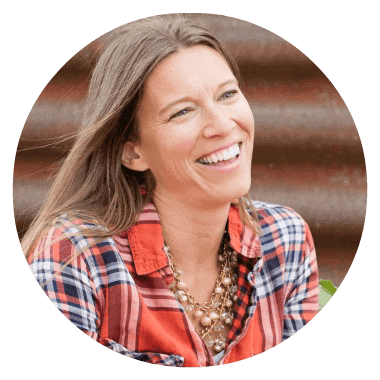 But it looks like Katie over at Wellness Mama has an answer for you: http://wellnessmama.com/5687/natural-creme-blush/ Hopefully that will work for you! Thanks, awesome post. Wonderful job Michelle. I’m certainly going to try this. But first, please is baking cocoa the same thing as cocoa powder? Also, while we’re at it, is corn starch the same thing as corn flour? I’m trying a lot of DIY stuff. Trying the DIY crayon lipstick. Still hoping to make the foundation. Thus the corn starch question. Hi. I love this recipes. Im thinking about making it in cream texture. But long lasting. Any idea? I am so excited to try this! Thanks for sharing! Love this thank you so much. I am allergic to hibiscus is there an alternative I could use? Hi Brenda! So sorry for the delay in replying – I’m on vacation and just saw this! 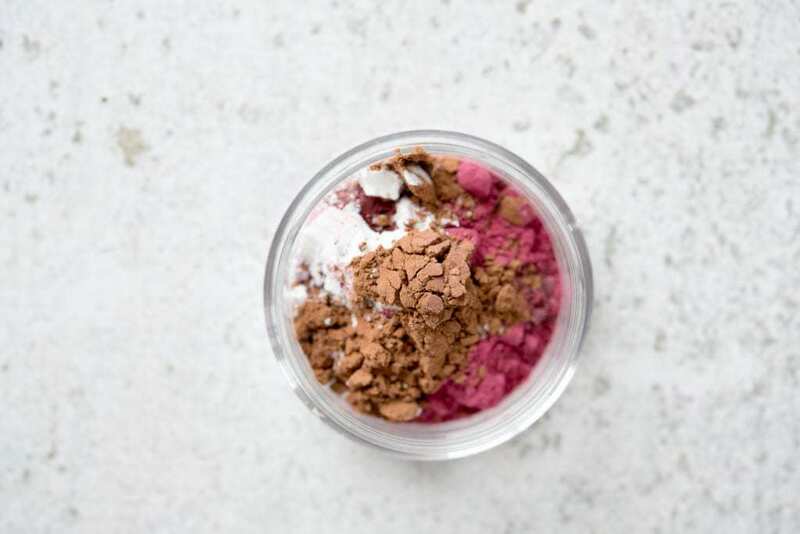 But the hibiscus is what gives it the pink color, so you could try using just more beet powder and see how that works. Kind of like mixing red paint with white to make a pink color… Let me know how that goes if you try it! Totally going to try this! Thank you so much Michele you inspire girls everywhere with your amazing makeup post not only making us save money but show us we don’t need to buy the designer brands! Thanks so much Megan! I hope you enjoy using it! hello, i am new to the whole diy thing but i really love it and like your ideas very affordable and healthy but i cant get peach powder where i live so can i make it myself or it can be replaced with other type to get the peachy color??? Hmm… I really haven’t tried any other thing to get peachy powder so I can’t say that it can be replaced with anything else. And making it yourself would require a freeze drier, which is not exactly cheap 🙂 Have you checked your local Wal-mart? I know they’ve been carrying freeze dried peaches. Or if you need to you can order it online. Sorry I don’t have a better answer for you! Have you tired rose petals powder? Different roses for different colours? I haven’t actually tried them – but they sound like they would work and be a really good option! If you do try them can you let me know if they work please? Could you add some alcohol to it and presss it to make it pressed powder? 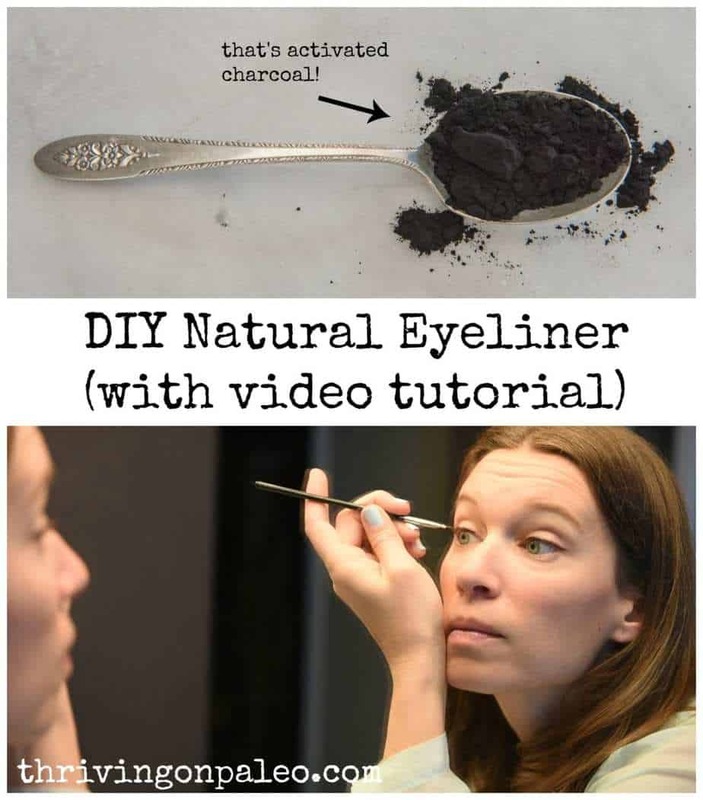 I am hosting a spa party for my daughter and I want to send the girls home with their own natural and safe makeup but I think the parents might kill me if I send home loose powder. It just seems messy. Hmm, I honestly have never tried it but I believe you could use a few drops of either alcohol or liquid almond or coconut oil with a few tbs of the powder, pack it down, and then let it dry. If you try it and it works, can you please let me know how it works out? What a cool party idea though! Sounds so fun! This is amazing!! I’ll definitely have to try this. I make my own face oil moisturizer. 1 part avocado oil, 1 part jojoba oil, and then 15 drops each of lavender, tea tree and frankincense essential oils. Works wonders for me, and my hubs even uses it, too! Thanks! And your facial moisturizer sounds wonderful! I’ll have to try it – I have all the ingredients here. Hey Michele… I want to try this one.. but the arrowroot powder isn’t available here in my City and right now I’ve no time to order it as it will take atleast 7-8 days to get delivered at my place… so can you tell me any other product or powder that I could use instead of arrowroot powder…?? I’ve never tried it, but I believe you can use corn starch as well, which should be more readily available to you.